"By November in Calgary the leaves are gone and the sun enters the living room unimpeded. At about mid-morning there is a very specific light that emphasizes colour and texture and brings out details that would otherwise not be noticed. The sun slices across walls, spilling over furniture and folds in the curtains. As it illuminates inanimate objects, it makes them come alive. There is a sense of urgency as the reflections of the blue sky, the folds of curtains and even the wicker furniture, shimmer on the hardwood floors for such a brief moment. If it isn't captured fast enough, it is gone. The Kuba textile cushions acquired in the Congo seem to glow for just a few minutes. The blue spruce is mirrored on the glass surface of the coffee table. The warm greens of the hanging fern contrast with the cool blues of the spruce tree. In the blue teapot is a mise-en-abyme, the reflection of the artist's easel. I turn to the paintings of Kenny Harris to learn how light plays on hardwood floors like on the surface of water. Descriptions of his work direct my paintbrush. The houses along the lane are Parkdale heritage homes, part of the historical streetscape. I play with the contrasts of indoor/outdoor, cold/warm. 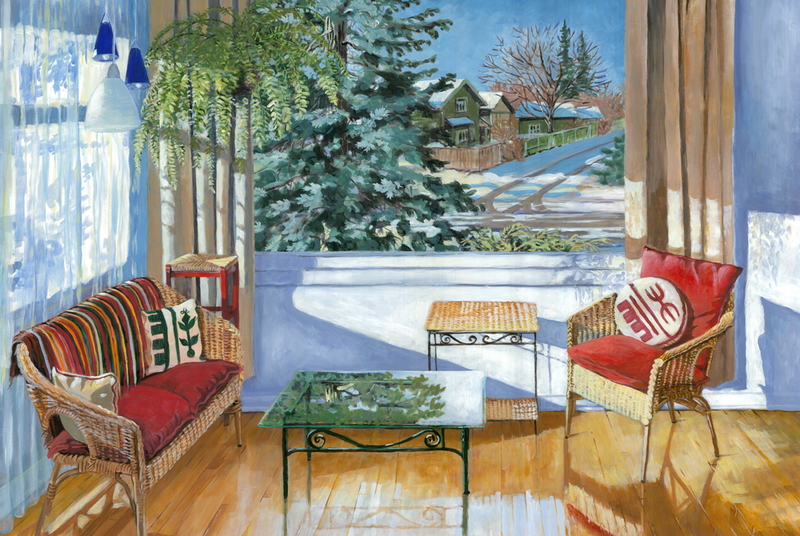 This painting was exhibited in the Federation of Canadian Artists Calgary branch exhibition.